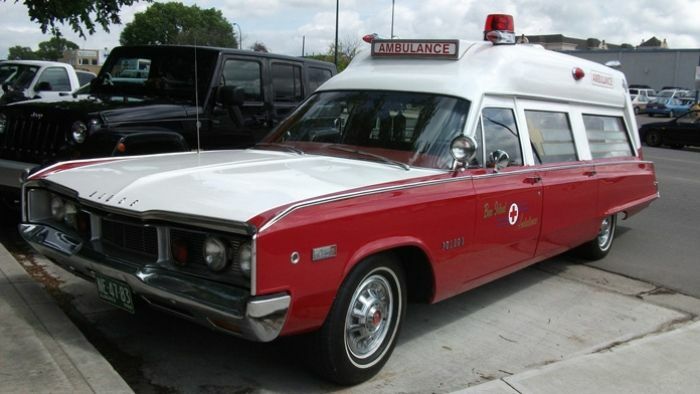 Medibank health humorist Nick Snelling explores the history of the ambulance. Given the ancient battlefield origins of the ambulance, where a mere mule ’n’ cart was dispatched post-fray to pick up the dead, dying and wounded, most people have probably felt the same way for over a thousand years. The first documented case of a mobile medical dispensary harks back to the Islamic conquest of Persia in the mid-7th century, where a fabled 17-year-old virgin by the name of Amina bint Qais led a posse of battlefield surgeons into the field to tend to the fallen. With the exception of cage-like transport during the Middle Ages for diseased pariahs, hammock carts and various iterations on the horse-drawn wagon continued on for centuries. In 1487, the ‘ambulancias’ of Spain’s armies, under the direction of their pragmatic monarch Queen Isabella, became famous. But it wasn’t until the Napoleonic Wars that soldiers were treated during battle – traditionally, the wounded were left to either bleed out or crawl back themselves, resulting in higher mortality. During the Battle of Spires in 1793, Napoleon’s personal physician, Dominque Jean Larrey, requested his general allow two ‘ambulance volantes’ or four-wheeled wagons into the warzone, and Napoleon, who up until then had held his medics back miles behind the front, saw the sense in it – if only because the shrieks of the dying were bad for morale. The American Civil War saw more advances. Joseph Barnes and Jonathan Letterman, both Union military doctors, introduced a horse-drawn ambulance cart into every regiment of the North. However, due to the sheer level of carnage, it was phased out, replaced by a four-wheel design called the ‘Rucker’ – named after the decorated Major General Daniel Rucker. In fact, casualties were so bad, steamboats and trains eventually had to be commandeered as makeshift ambulances to transport soldiers from the front. Civilian hospitals took longer to catch on. While London’s cholera epidemic of 1832 saw a specially outfitted transport carriage for the sick instituted, it wasn’t until 1869, at New York’s fledgling Bellevue Hospital, that a proper ambulance service was created. Developed by an ex-Union surgeon, Edward Dalton, a stable of horses was kept on-site, with innovative ‘drop-harnesses’ poised above their stalls for quicker bridling, while the carriages were stocked with the staple medical equipment of the age – bandages, tourniquets, splints, moprhine and brandy. In 1887, the St John Ambulance Brigade was established in London and exists to this day. A motorised ambulance didn’t appear until 1899, donoted to a Chicago hospital by 500 wealthy businessmen – and the two-horsepower model was quickly adopted elsewhere. In 1909, the first mass-produced ambulance appeared in the US called the Model 774. As always, the real innovation continued at war. During WWI, Canada’s bullet-proof Palliser, England’s hardy Straker-Squire l and the classic Model T field ambulances of the Red Cross quickly phased out horse-drawn carts. Later, America’s Dodge WC-54 was standard at all battles by WWII, and aerially, the H-13 Sioux medi-chopper (remember M*A*S*H?) saved over 18,000 soldiers during the Korean War. Since then, on the modern warfront, medical help and aerial transport has never been speedier. Nowadays, ambulances are more like custom-built mobile hospitals – and rather than a team of grubby saw-bones more motivated with relieving you of your spoils of war than saving your life, they are staffed by trained paramedics. Ergonomically designed, retro-reflectively lit, stocked with fold-out stretchers, plasma stocks, defibrillators, oxygen tanks, and a wide range of pharmaceuticals and pain-relief medicine, as far as bumming a lift to the hospital goes, you could do a lot worse.